Top O’ the mornin to ya! 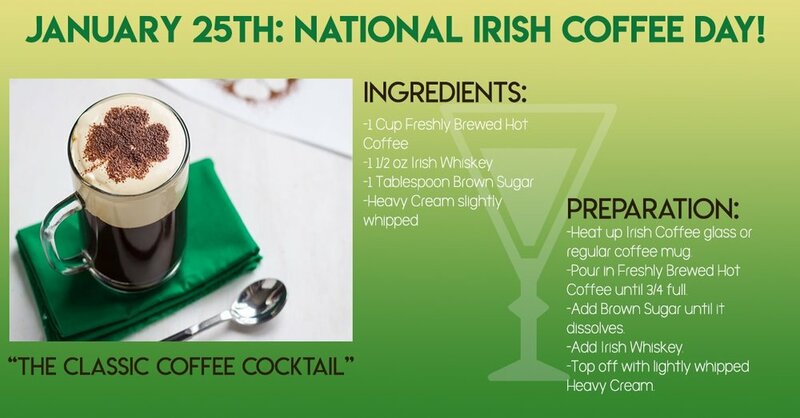 Happy Irish Coffee Day! If you’re not awake, take our recipe and make yourself the most famous coffee cocktail of them all. The Irish Coffee is one of those concoctions bartenders have made from little inspiration, but we are oh so thankful they did. As long as you make it hot, with Irish coffee, and with cream- you can’t go wrong with this international winter favorite. Some people add Bailey’s Irish Cream liqueur for a little more sweetness but also a lot more kick. You can even go the extra mile and add a little chocolate syrup, but we know- that’s a lot of sugar. Here at Happy Hour City we like the traditional version and we use our favorite Irish whiskey- Jameson, so do Ireland the honor and use the Jameo. Turns out, Foynes was the first Irish transatlantic Airport in 1939, that’s when Pan Am did their first passenger commercial flights from New York to Foynes. Everyone coming into Ireland saw Joe, and it made him famous. Until then passengers to the US from Europe flew into Shannon Airport 35 miles away and were bussed to Foynes. That’s when he met the group of passengers heading back to America and made them a coffee they’d never forget! But it wasn’t them who brought it over to the states. A reporter who stopped in at Foynes made Joe’s coffee famous and brought it back to San Francisco, where Buena Vista Cafe began serving it. Stanton Delaplane wrote for The San Francisco Chronicle, and his article is what made Joe’s drink world famous. After sampling Irish Coffee at Foynes in 1951 Delaplane flew home and he spent a long evening at the Buena Vista Cafe near the foot of Hyde Street working out the proper balance of ingredients it was their idea to add the whipped cream. Buena Vista needed something new until Delaplane gave him the basic recipe, it was a quiet neighborhood bar. Overnight Jack Koeppler found himself the proprietor of the most prosperous saloon in San Francisco. Buena Vista Cafe actually offered Joe a job in 1952 and he moved to the Bay. He worked there for 10 years and is buried in Oakland, CA. If you have had Irish Coffee you know it's as good in the morning as it is on a cold night. It's a great way to pass the cold month of January and if you're in the Bay area stop by Buena Vista Cafe- it's still open today!